Here I am pictured with the late great “prince of print” himself, Sir Gary Halbert. My brother Joe Polish and I were among a handful of attendees at this private seminar at sea. (It was held on a cruise ship). Boy, what a crazy time this was. However, Gary taught us all some amazing things and I worked with him many times after this event. Gary gave me the rights to videotape this sea-bound seminar, and I hold the only existing copies of what he taught there. So far, I haven’t made the videos available, but now that the legend himself has passed away, I may do so in his memory. 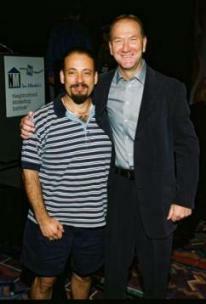 Here I am at one of Dan Kennedy’s super conferences with Joe Sugarman. Joe is an excellent marketer and one of the top advertisers in America. Joe is famous for his books, videos, and audios. His famous books include advertising Secrets of the Written Word, Triggers: 30 Sales Tools You Can Use To Control the Mind of Your Prospect to Motivate, Influence and Persuade, Marketing Secrets of a Mail Order Maverick, Television Secrets for Marketing Success, and Success Forces. All of his books are brilliant and Joe is a true gentleman. One of my top 10 most favorite marketers and copywriters. 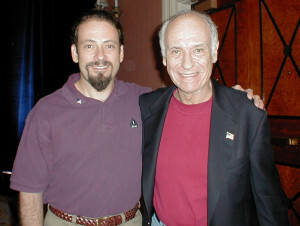 Here I am with one of my first mentors, Dan Kennedy. He was always one of our speakers when we held Boot Camps. Dan is internationally recognized as a ‘millionaire-maker‘, helping people in just about every category of business turn their ideas into fortunes. He has been called the “Professor of Harsh Reality” because he’s provocative, irreverent, sarcastic, and tells it like it is in a humorous, but chillingly, serious fashion that cuts to the core of the issues in a way no other marketing ‘guru’ does. In short, he’s a brilliant but irritating guy. I learned a ton studying his materials and working with him and I’m grateful for that. In 1998 I wrote a piece that beat the performance of the sales letter Dan wrote for us, that had been our control at Piranha for years. To my knowledge, the piece I created remained the control for Piranha. I have since rewritten at least 3 of Dan’s letters for clients. This was the last time I got to see my friend Thomas K. Crawford alive. This Christian brother went home to be with the Lord after a freak bicycling accident in 2006. Tom founded the Leadership Network Corporation with his wife Tammy to help cultivate business relationships for leaders. At the same time, Tammy and Tom founded the Leadership Children’s Foundation, a philanthropic organization that exists to help raise money for children charities and improve the quality of life for young people across the nation. LCF has raised over $2 million for charities that include the Juvenile Diabetes Research Foundation, Childhelp, The National Center for Missing & Exploited Children, and many others. With a background as diverse as running national political campaigns, inking Wall Street deals, and financing business growth, Mr. Crawford served as Chairman & CEO of Leadership Network Corporation until his untimely death, and it is now headed up by his dear wife Tammy. Leadership Network Corporation owns and produces leadership conferences that focus on gathering the influential business leaders of an industry, in order to bring them together to interact and learn from each other. The events are founded on two principles. The first is to gather the great minds and great things will happen. It is through shared ideas and meaningful interaction that business leaders stimulate not only their marketplace, but also the economy as a whole. The second principle is that relationships are the most precious commodity in business today. Prior to founding Leadership Network, Mr. Crawford served in high-level positions, including Senior Vice President of Franchise Finance Corporation of America (FFCA), President of FFCA Institutional Advisors, and as a member of the Board of Directors for Phone Bank Systems. Mr. Crawford also served on the Board of Directors for Childhelp USA and Juvenile Diabetes Research Foundation. He is missed, but his legacy goes on, changing lives for the better. 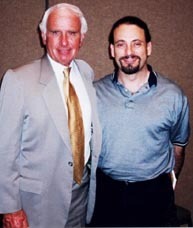 Here I am with Jim Rohn at one of Dan Kennedy’s superconferences. You may know of Jim as a popular American motivational and business coach. He has been giving seminars to large companies and indivuals for more than 40 years. He is a published author of many books that cover leadership, business skills, self development, dealing with customers, and motivation. Jim Rohn simply cannot be described nor defined. Instead, he must be experienced. The remarkable combination of his personal style and his message does something to people that cannot be captured in a text description. The power that is behind his extraordinary effect on people is not found just in what he enables them to learn, but in what he makes them feel. Time spent with Jim Rohn, whether at a live seminar or through his audio and video programs, is an indescribable emotional journey that will expand your self-confidence, rekindle your determination to succeed and enrich your attitude – further intensifying your ambition to alter your life for the better. Carl Galletti has risen to the top of the world of direct response advertising, copywriting and Internet marketing, and is now considered by many to be one of the best freelance copywriters and marketing experts in the country. Carl and I share a unique place as a copywriters, because our marketing skills are at least as valuable to our clients as our copywriting skills. In fact, many of the top people in direct response advertising have turned to Carl to write copy for them. 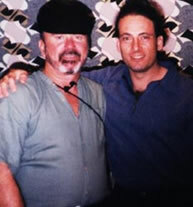 One of them is the late great direct marketing expert Gary Halbert, (pictured at the top of this page). Gary selected Carl to be a part of a handful of the best copywriters in the country who would write ads for the people attending two of his high dollar seminars. 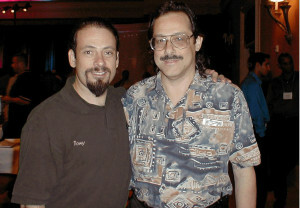 Jay Abraham is another “guru” who has hired Carl. Jay is considered to be the top marketing consultant in the country. He charges $3000 per hour for his telephone consultations and his seminars cost as much as $20,000 for five days. Carl has written several direct mail sales letters for Jay. Carl’s client list is diverse. He has worked with authors, professional speakers, publishers, computer companies, contractors, executive search firms, printers, training organizations, jewelry manufacturers, schools, health technology firms, and the American Red Cross. Anyone can benefit from Carl’s advice and copy. I offer one of his courses on my products page and I encourage you to take a look at it. Blue Man Group is the three-man performance troupe, the bald, blue-headed guys who, though unspeaking (and occasionally unspeakable), have been wreaking havoc on contemporary art in the intervals between playing their own music on plumbing pipes at the Astor Place Theater in Manhattan since 1991. The original Blue Men, Matt Goldman, Phil Stanton and Chris Wink, were street performers who established their own Club Nowhere on a sidewalk outside the Copacabana in the late 1980’s. By now, Blue Man has effected a corporate merger with himself. Thirty other Blue Men have joined the troupe, plus two in training. On Third Street in the East Village, Blue Man has an enormous rehearsal and performance theater, plus a recording studio (its first CD, ”Audio,” came out last year). 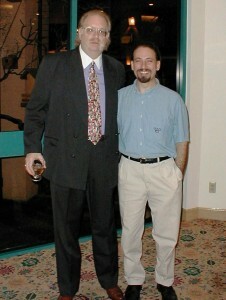 I first met Mike Vance at one of Dan Kennedy’s super conferences. Mike is a distinguished name in speaking and communicating. His fast-paced delivery, sprinkled with good natured humor, makes him one of the most stimulating speakers and sought-after teachers. Mike Vance spent years in charge of idea and people development for Walt Disney Productions, Disneyland and Walt Disney World. Vance was also Dean of Disney University, famed for its superlative training programs which set a new standard for customer service. The programs Mike created to prepare the leadership cadre for Walt Disney World have become exemplary models. He is considered one of the outstanding innovators in management development, training, and building corporate cultures. Mike Vance began speaking about “out of the box thinking” 30 years ago, popularizing the phrase “Think Out of the Box.” He co-founded the Creative Thinking Association of America with Diane Deacon, and they have written the books Think Out of the Box, Break Out of the Box Techniques for Achieving Breakthroughs and Raise the Bar Creative Strategies to Take Your Business and Personal Life to the Next Level. Mike Vance worked with Walt Disney during the start up of Walt Disney World. His interest in environmental design came from his direct exposure as a student to Frank Lloyd Wright, Buckminster Fuller and Walt Disney. He helped create G.E.’s multi million dollar high tech learning center, as well as many other unique design concepts for corporate headquarters, training facilities, and others. 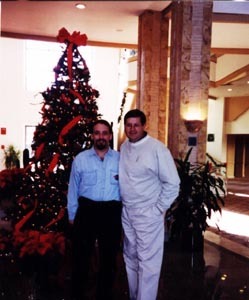 Robert Allen and I celebrating a little Christmas cheer at one of the seminars Joe and I did during my Piranha Marketing years. Robert Allen is the author of the colossal best-seller “Nothing Down” and there is an updated version called; “Nothing Down for the 2000s: Dynamic New Wealth Strategies in Real Estate ” established Robert Allen as one of the most influential investment advisors of all time. Robert Allen has followed that success with three other best-selling books including Multiple Streams of Income, as well as the audio-cassette programs “The Road to Wealth” and “Multiple Streams of Income” from Nightingale-Conant. A popular talk-show guest, Robert Allen has appeared on hundreds of programs, including “Good Morning America” and “Larry King Live.” Robert Allen has also been featured in the Wall Street Journal, Newsweek, Barron’s, Money Magazine, and Reader’s Digest. Thousands of people have attended Robert Allen’s cutting edge investment seminars for decades! 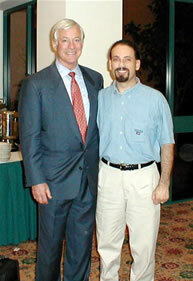 Brian Tracy is the most listened to audio author on personal and business success in the world today. He is a dynamic and entertaining speaker with a wonderful ability to inform and inspire audiences toward peak performance and high levels of achievement. Originally from Canada, Brian started on his own “road to success” in his twenties when he left Canada to travel across the world. His goal was to cross the Sahara Desert. He worked his way through Canada and throughout the United States before securing a “working” passage on a freighter to England. While that sounds pretty exciting, I bet it wasn’t nearly as thrilling as the “pedal to the metal” ride I gave him from our seminar to the airport. 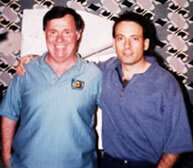 Brian had just finished speaking for Joe and I at one of our 1999 seminars. I saw him looking pretty concerned near the bell desk and asked him if everything was alright. He told me he was waiting for his limo ride to the airport and it was very late. I asked him what time his flight left and when he answered, I knew he HAD to leave immediately if he was to make it. So I ran to my car, pulled up to the front door and got him loaded up. I told him to buckle up and hold on. He did. (I think the only reason I got him to the airport without getting a speeding ticket was divine intervention). Anyway, Brian is an awesome guy who has produced more than 300 different audio and video learning programs covering the entire spectrum of human and corporate performance. These programs, researched and developed for more than 25 years, are some of the most effective learning tools in the world. When last I checked, Brian was living in San Diego with his wife Barbara and their four children. 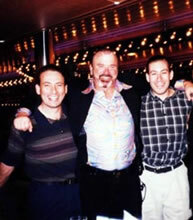 From left to right, this is a shot of me, Gary Halbert and my little bro, Joe Polish – taken on the Caribbean cruise and seminar at sea in 1998. The Prince of Print, Gary, died in his sleep on Easter Sunday in 2007. That was the day the copywriting world has lost one of its biggest icons. There will NEVER be another Gary Halbert. The first time Kenneth A. Kerr Jr. saw a Walt Disney character dart across a movie screen, animation captured his imagination. All he could think about was some day, in some way, working for Disney. So he wrote a letter to his childhood hero, hoping for some advice and encouragement. When he received a reply, signed by Disney himself, he was ecstatic. In 1978, with a decade of experience in art and marketing, Mr. Kerr joined the executive ranks of Walt Disney Imagineering, a division of The Walt Disney Co. in Glendale. During the next five years, he was in charge of graphics and signage development for Disney theme parks, including Epcot, Tokyo Disneyland and an updated Fantasyland. Mr. Kerr, who operated AdMark Inc. in La Jolla in recent years, died July 24 at Scripps Memorial Hospital La Jolla. He was 61. He had been ill since February and died of respiratory failure, his sister said. During a 36-year career in various aspects of marketing, Mr. Kerr designed and developed the California Dancing Raisins, introduced in a 1986 promotional campaign by the California Raisin Board. As director of research and development and marketing communications for Applause Inc. in Woodland Hills from 1983 to 1987, he also was involved in developing and licensing products depicting several characters popular with children. They included the Smurfs, Wuzzles, Gummi Bears, Sad Sam, Raggedy Ann and Andy, and the Muppets. Mr. Kerr returned to his San Diego roots in 1987, joining SeaWorld as director of marketing communications. He helped produce the theme park’s 25th anniversary celebration and organized and directed its first internal creative services department. After forming his own company, Ken Kerr & Associates, in 1988, he took on such clients as Johnson & Johnson, author Ken Blanchard, Block Medical and Mail Boxes Etc. Throughout his career, Mr. Kerr painted in watercolors, concentrating on Americana-inspired scenes. His paintings have been exhibited by the National Watercolor Society, the San Diego Art Institute, the Los Angeles Art Association and the Smithsonian Institute. Thirteen of his paintings, created over a 20-year period, have been displayed in Washington, D.C., by the Air Force Historical and Documentary Art Program. “Ken began painting when he was about 2,” his sister said. He was listed in Who’s Who in American Art and won more than 100 regional and national awards for his watercolors. Mr. Kerr, a native of Pittsburgh, moved with his family as a child to La Mesa. He graduated from Grossmont High School and San Diego City College, then earned a bachelor’s degree in advertising design at the Art Center College of Design in Pasadena. He began his career in San Diego in 1968 as an art director and a copywriter at the Phillips Ramsey public relations agency. The following year, he joined Group West Inc. in Los Angeles, where he created Woodsy Owl and the advertising slogan, “Give A Hoot, Don’t Pollute,” for the National Park Service. Here I am with Jay at Mark Joyner’s Vegas seminar in 200?. I don’t really remember the year, (or a lot of the seminar) I spent most of my time talking with my marketing buddies outside. Jay Conrad Levinson is the author of the best selling marketing series in history, Guerrilla Marketing, plus 24 other business books. His guerrilla concepts have influenced marketing so much that today his books appear in 37 languages and are required reading in many MBA programs worldwide. Jay taught guerrilla marketing for 10 years at the extension division of the University of California in Berkeley. He was a practitioner of it in the United States as Senior Vice President at J. Walter Thompson, and in Europe as Creative Director at Leo Burnett Advertising. Cool enough eh? 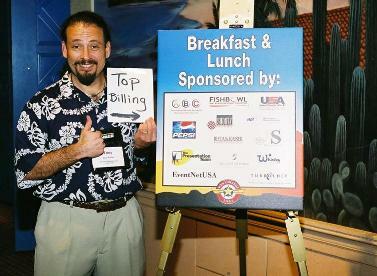 I had the pleasure to speak at the 10th and final Neighborhood Marketing Institute War College in 2003. The War College was an enormous three day event put on by my client Tom Feltenstein (pictured below). Over 1000 attendees from the food service and hospitality industries showed up to learn proven-tactics that build top line sales (for one or thousands of units). The War College was THE “cure” THE “better way” to win the marketing war in these attendees neighborhoods. I enjoyed the chance to speak to these folks about copywriting and was AMAZED at how little some of the big wigs knew about direct response. It was however very interesting to network with the industries top executives.